The incidence of pancreatic carcinoma is steadily increasing in Western countries. This tumour is now the fourth commonest cause of cancer death in the UK and USA. The incidence increases with age and most patients are over 60 years of age. Males are affected more than females. There are no known aetiological factors, but the increasing incidence has been attributed to an increase in both smoking and the consumption of alcohol. Excessive coffee and dietary fats have also been implicated. Most carcinomas of the pancreas are adenocarcinomas arising from duct epithelium. In 60% of cases the tumour is in the head of the pancreas. The tumour spreads locally to involve lymph nodes and the liver. 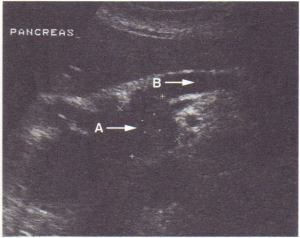 CARCINOMA OF THE HEAD OF THE PANCREAS OR THE AMPULLA OF VATER presents with painless jaundice due to obstruction of the common duct. However, most patients will have pain at some time in the course of their disease. Weight loss also occurs. presents with abdominal pain, anorexia and weight loss. The pain is often a dull, boring pain that radiates through to the back. It may be relieved by sitting forward. Jaundice is rare. Diabetes may occur due to insulin resistance. This is now thought to be caused by islet amyloid polypeptide, a hormonal factor secreted from pancreatic 13 cells. There is an increased incidence of thrombophlebitis. In carcinoma of the head of the pancreas, examination will reveal jaundice with the dilated gallbladder sometimes being palpable (Courvoisier’s sign). A dilated gallbladder is not found with gallstone disease because of the accompanying chronic inflammation of the gallbladder. A palpable mass can be felt in 20% of patients, with hepatomegaly being present in most cases eventually. Haematological or biochemical tests (including blood glucose) are not helpful. Diagnosis is usually made using ultrasound or CT scan and confirmed by fine-needle or Trucut biopsy. However, in almost all cases, by the time the tumour is detected resection is impossible. 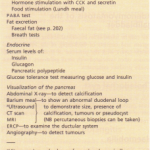 Duodenoscopy with ERCP may detect tumours of the head of the pancreas or of the ampulla. 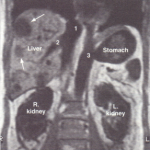 MRI or endoscopic ultrasound may become useful aids to imaging. 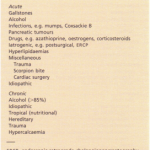 The differential diagnosis includes all causes of painless jaundice and persistent upper abdominal pain in the elderly. The 5-year survival rate is miserably low at 2%. Resection of the tumour with total pancreatectomy is not usually possible, and, as this operation carries a very high mortality (20%) and morbidity, it is seldom attempted. Jaundice from carcinoma of the head of the pancreas is usually relieved by a bypass procedure. This is now performed endoscopically with the placement of a stent through the narrowed area of the common bile duct to allow drainage. An expandable metal stent is now being used which remains patent longer. Surgical bypass where the common bile duct is anastomosed to the jejunum is now reserved for cases where the turnour has obstructed the duodenum. Chemotherapy and radiotherapy have had little success in decreasing mortality. Ampullary tumours have a better prognosis than pancreatic carcinomas and every attempt should be made to diagnose these rare lesions, as a resection in these cases can be performed. Pain and symptoms of anxiety and depression are an important part of management and analgesia with longacting oral morphines should be used liberally. Addiction is not a problem in these terminally ill patients. Palliative care teams play an important role in this distressing condition.